We're back and bringing you a wedding from the Big Easy this Wedding Wednesday. 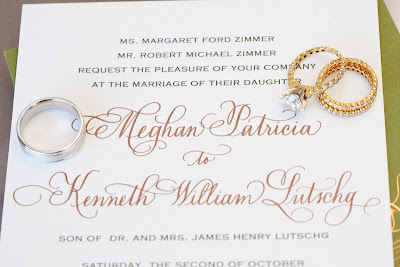 Happy one year anniversary to Meghan and Ken! 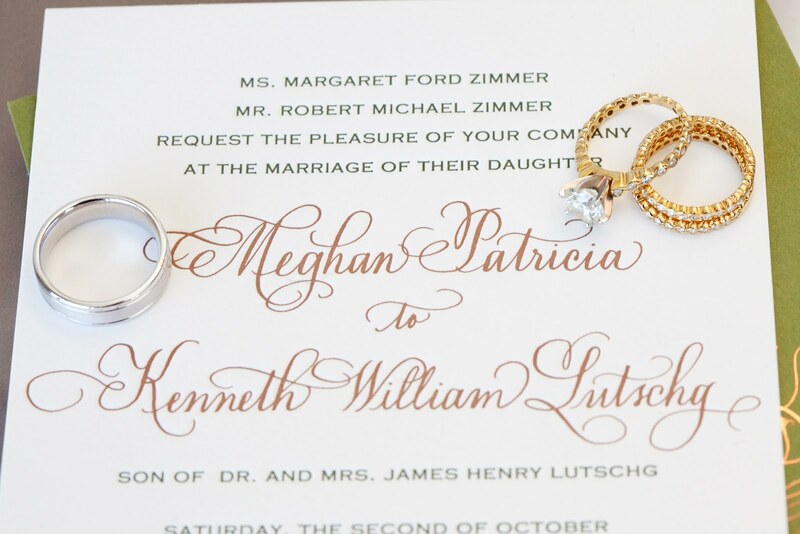 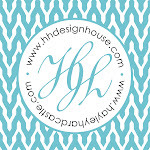 This October wedding is especially dear to HH Design House because the bride, Meghan Zimmer Lutschg is one of Hayley's life-long best friends! 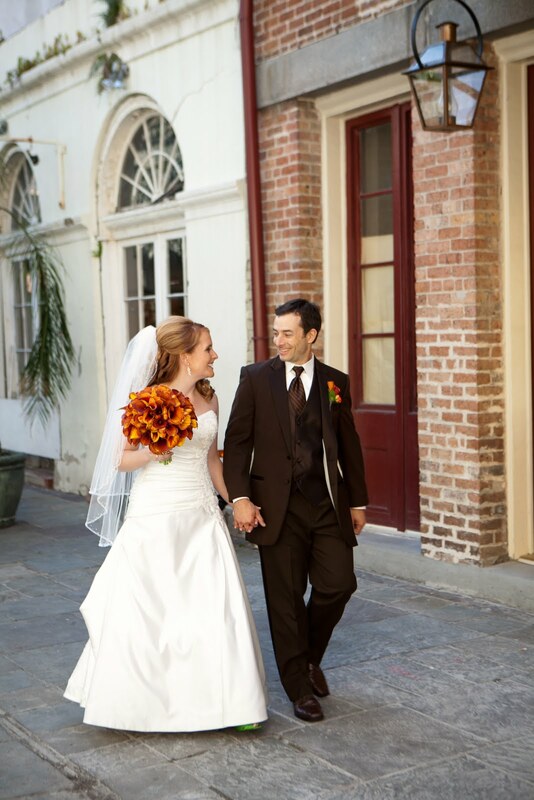 HH Design house created so many details with this beautiful New Orleans wedding. 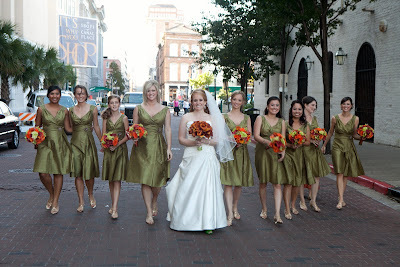 Meghan chose pumpkin orange and moss green for her colors. Meghan and Ken wanted a special logo that incorporated the spirit of New Orleans in their wedding festivities. They chose a fleur-de-lis, which is symbolic of NOLA's french-creole culture, with an M and K on either side. 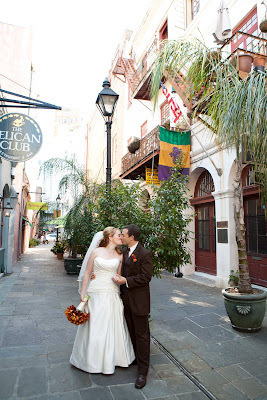 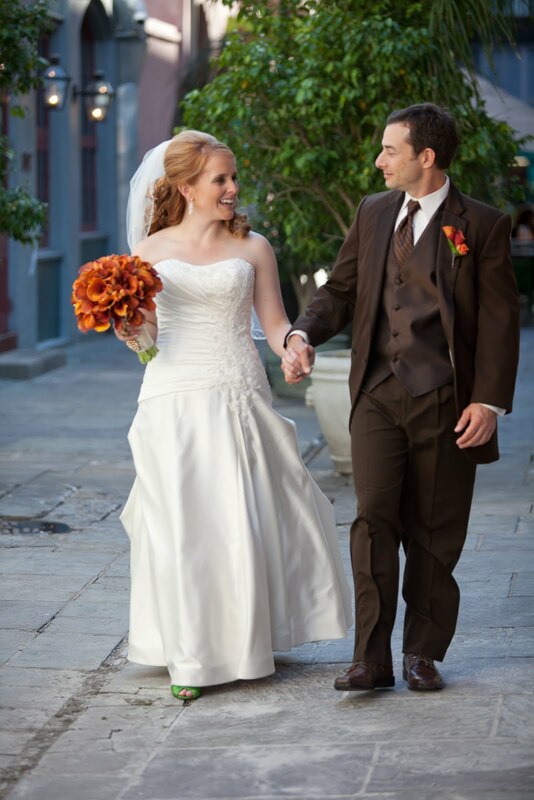 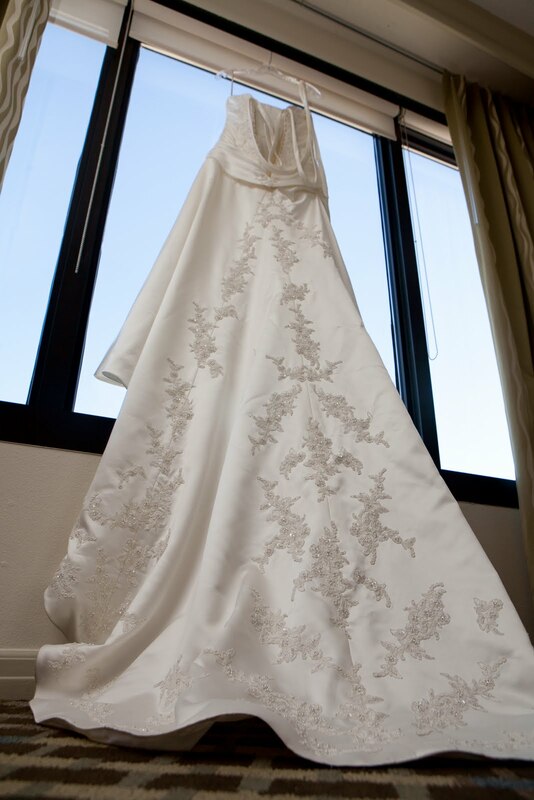 They were married at the Plimsoll Club at the Westin Hotel in the heart of New Orleans. 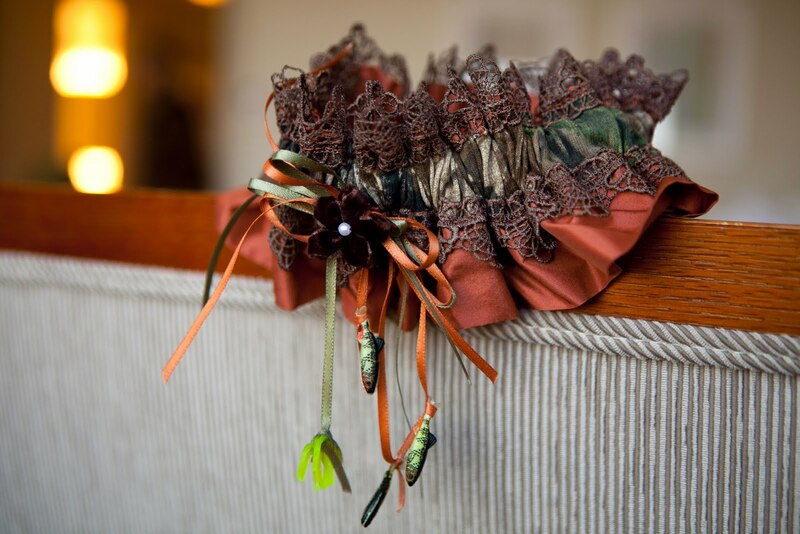 Meghan's mom, Maggie, handmade her wedding garter and toss garter in her colors, and wish a nod to the groom's prior first love -- fishing! 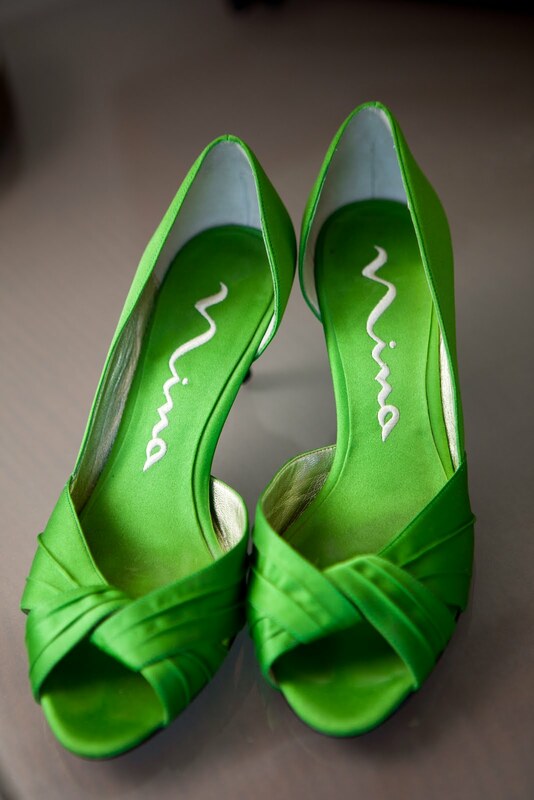 These are the beautiful green shoes worn by the bride that also matched her fall motif. 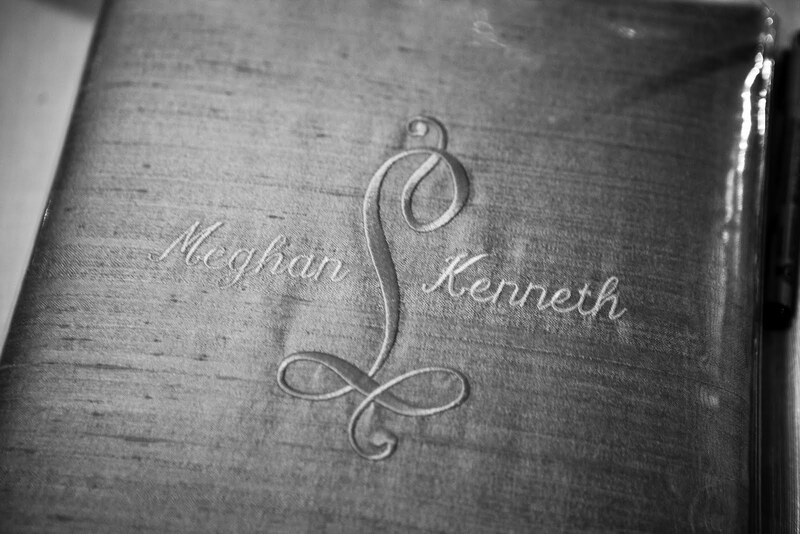 Every last detail was about Meghan and Ken. 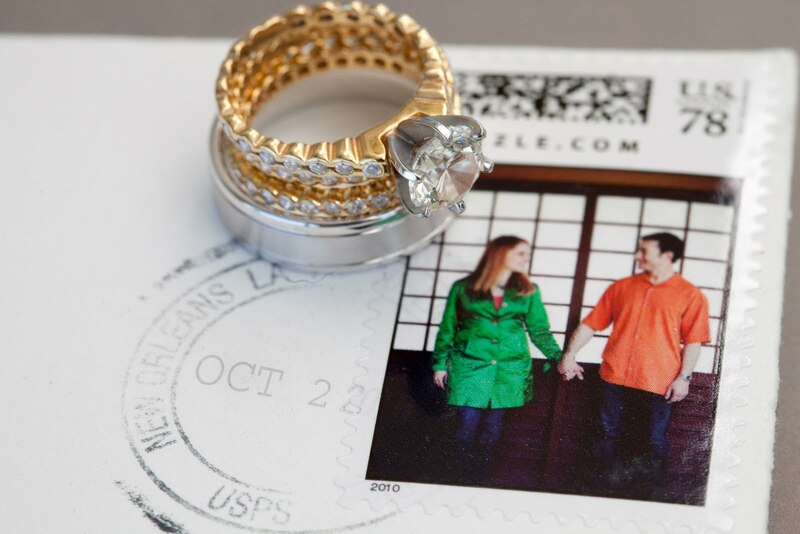 These photo stamps were stuck on the wedding invitations, and the photographer had it hand-canceled in New Orleans with the Wedding Date! 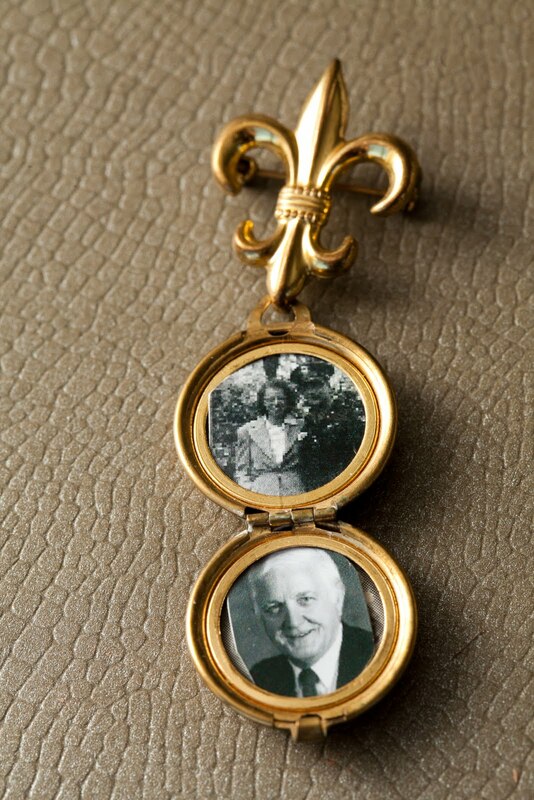 What a neat keepsake. 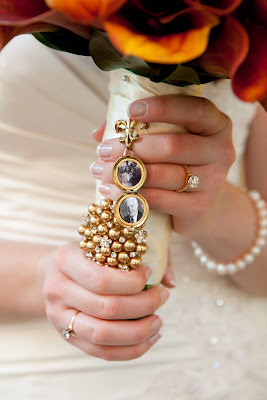 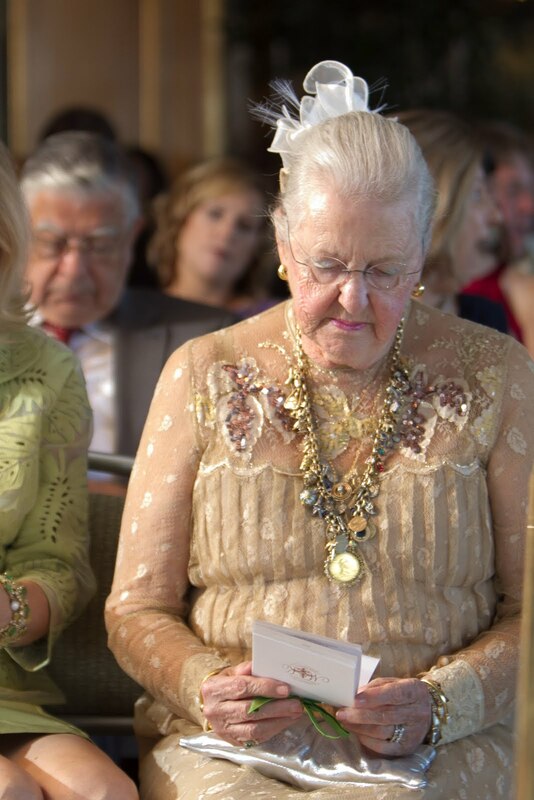 This locket holds the photographs of Meghan's grandparents who passed away, and the Rehearsal dinner invitation on Crocodile Paper can be seen as the background. 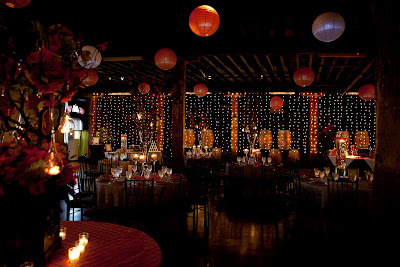 The inviations were designed by Hayley with her beautiful "signature calligraphy". Meghan and Hayley had long been designing their dream weddings together, but Ken takes credit for having the ideas that eventually evoloved into the Wedding Invitation: A beautiful two-color letterpress invitation presented in a green pocket folder that has the orange foil impression of their Custom Monogram embellished on the front. 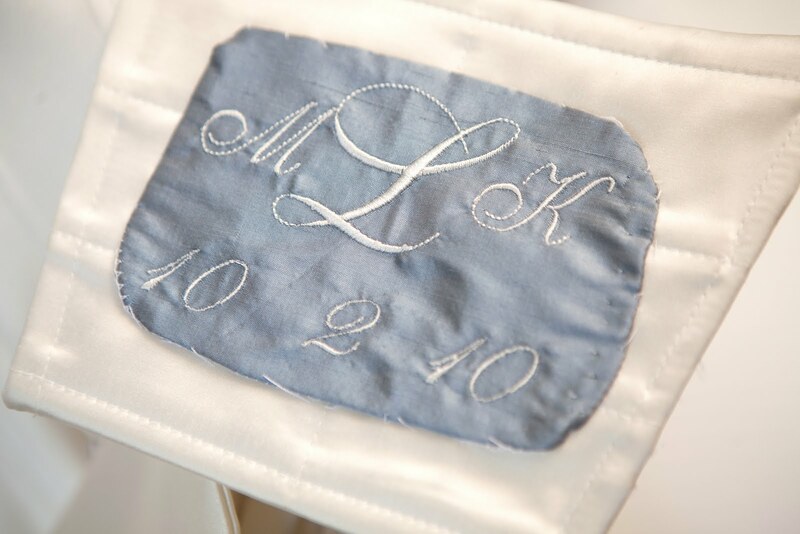 Meghan's mom, who is quite the seamstress, helped her out with Something blue....a piece of monogrammed silk with their monogram and wedding date sewn inside her gown. Finishing up the last details before "I do". Meghan and Ken walking hand-in-hand to the ceremony. 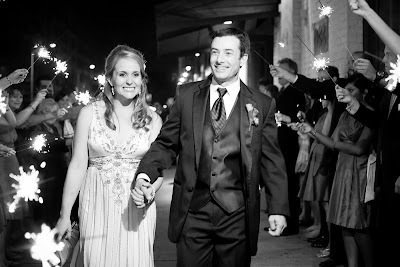 They are so happy! Meghan held on to the locket of her grandparents during the ceremony. 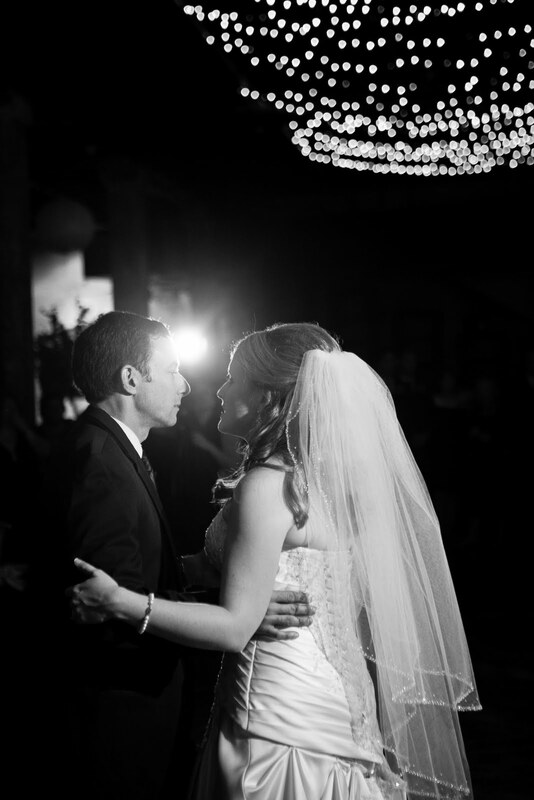 One last kiss before it's made official! Best friend hug! 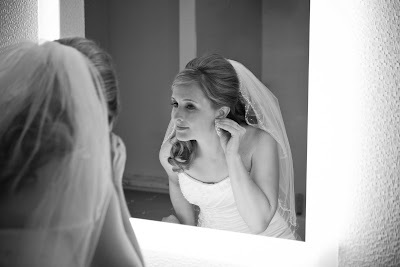 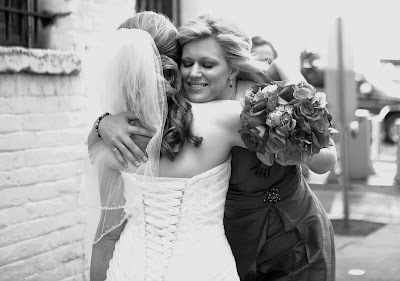 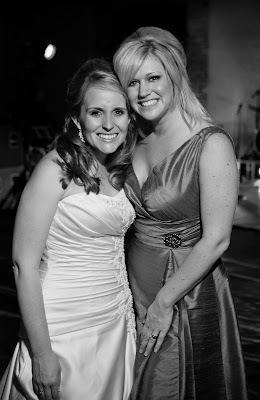 Hayleywas honored to serve as Meghan's Matron of Honor. Here is Meghan with her bridesmaids and junior bridesmaids before the ceremony. A guest is looking at the programs designed by Hayley with the special monogram. 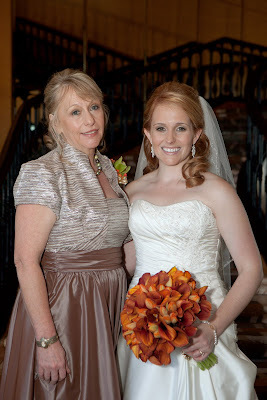 This special guest is actually Hayley's grandmother, who got to be honorary grandparent for the day as well! 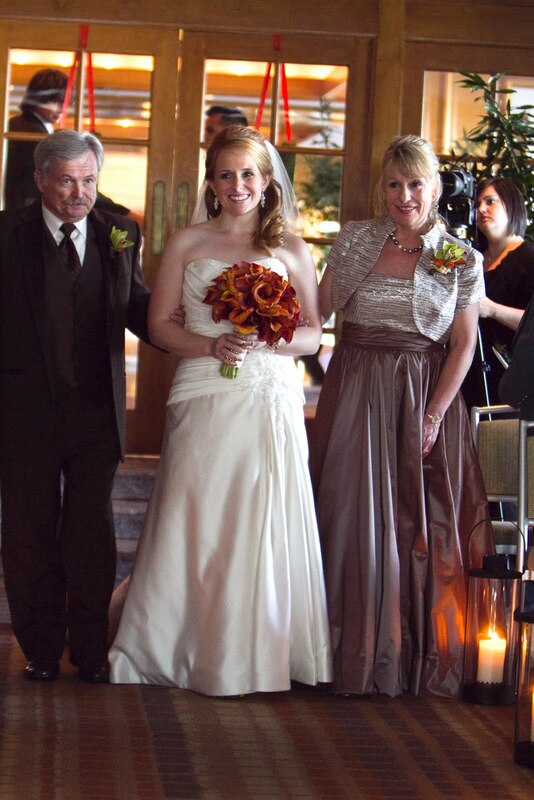 Meghan with her parents walking her down the aisle. 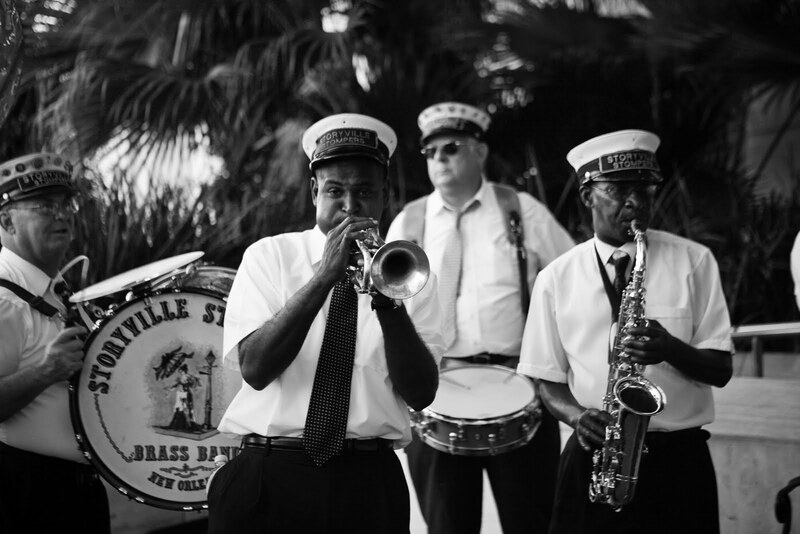 What is New Orleans without jazz? And they got the party started in a BIG way with the Second Line. 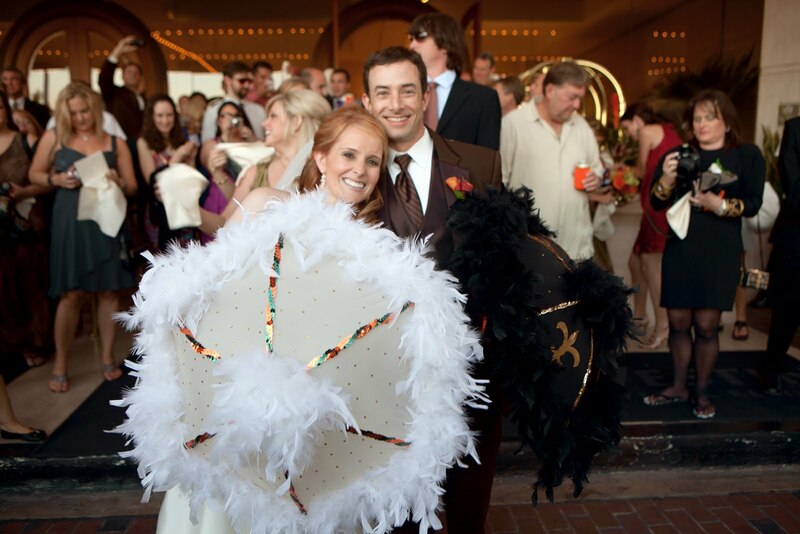 The bride and groom with special feathered umbrellas ready to walk. 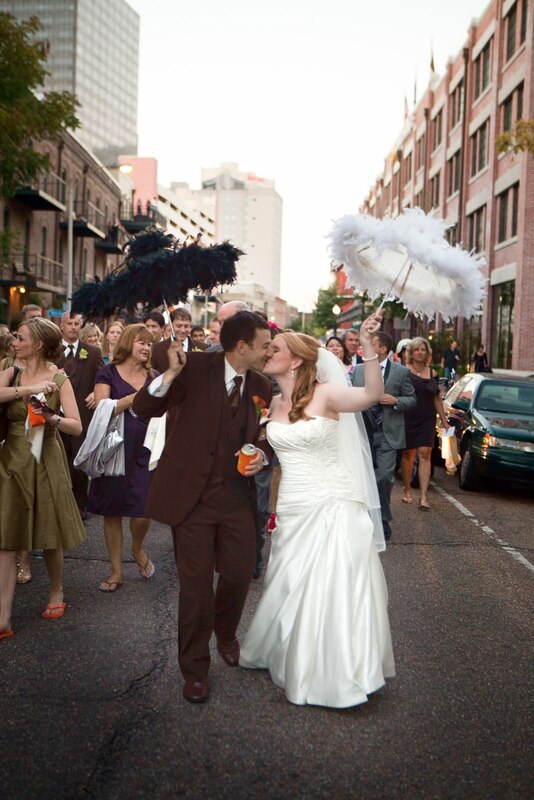 Dr. and Mrs. Lutschg doing the traditional New Orleans "Second Line" to the reception. 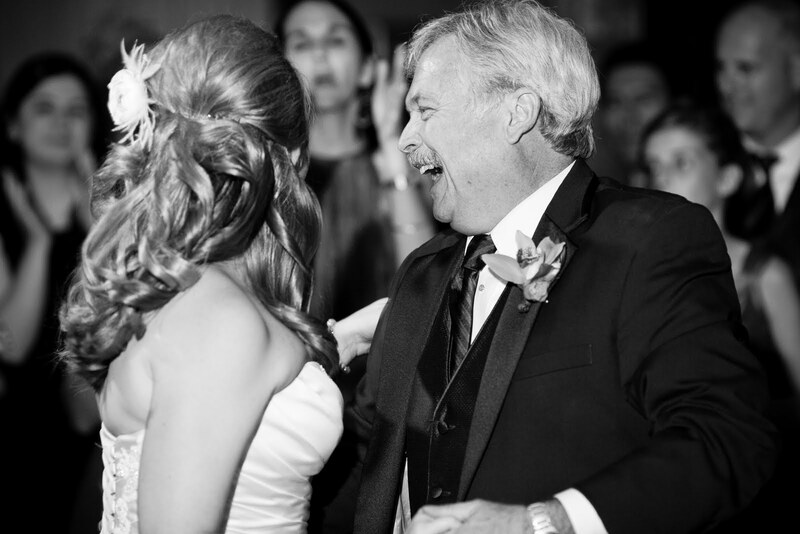 Lead by the marching band through the streets, wedding goers wave handkerchiefs and even passer-bys stop and join in the fun and dance to the music. It's a traffic stopper for sure! The reception was held at the Foundry, which is where the Second Line wraps up. 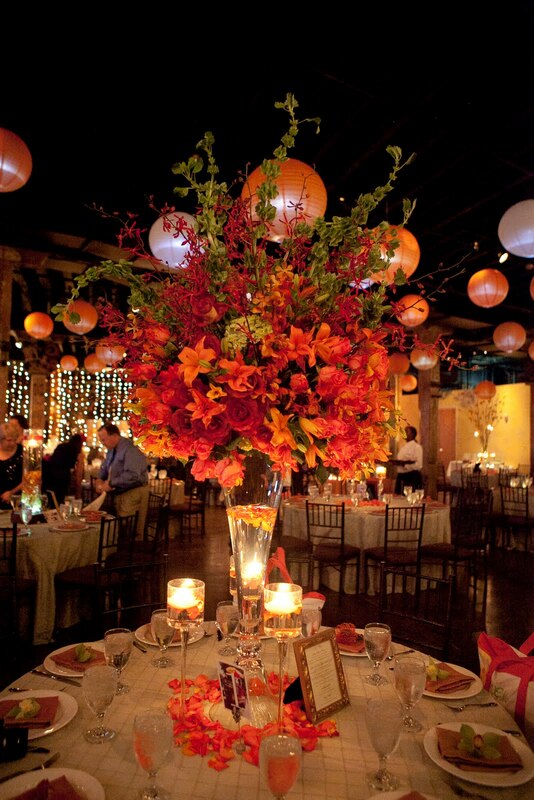 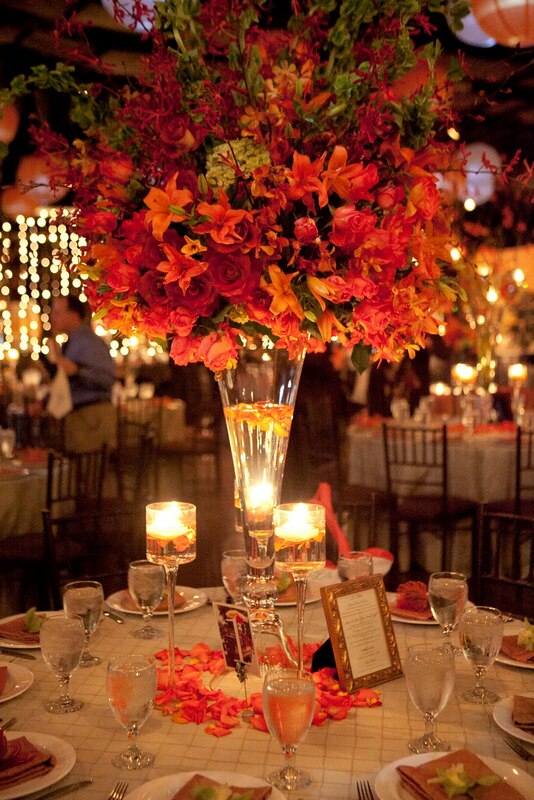 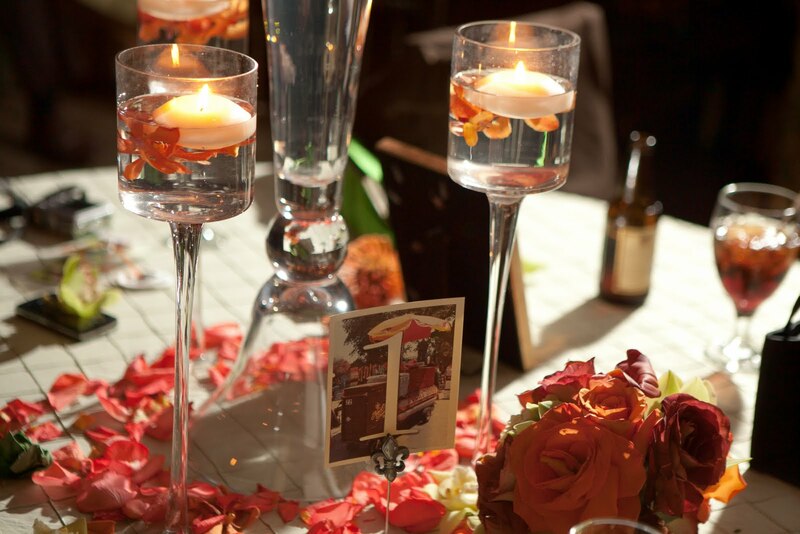 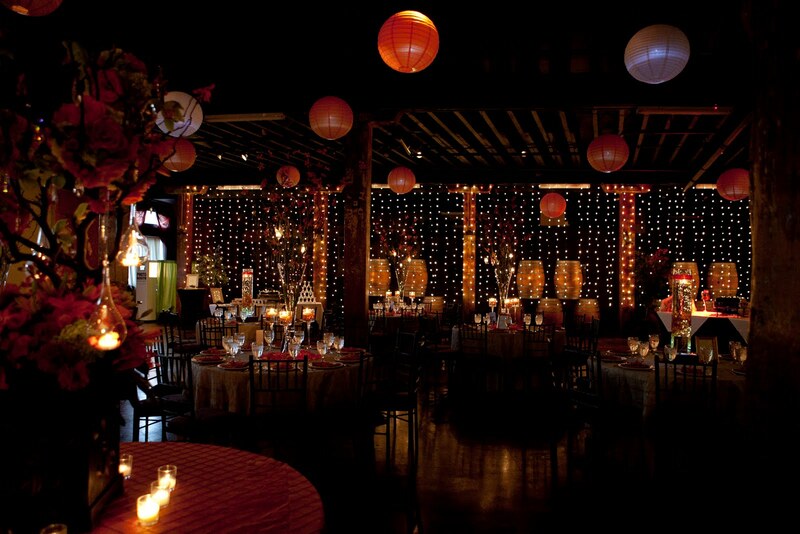 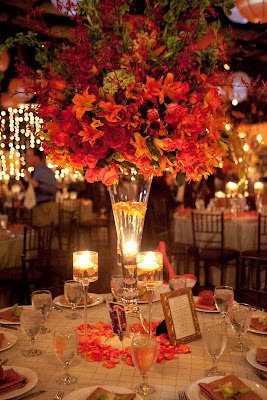 The centerpieces represented the color scheme well using beautiful shades of oranges and greens. 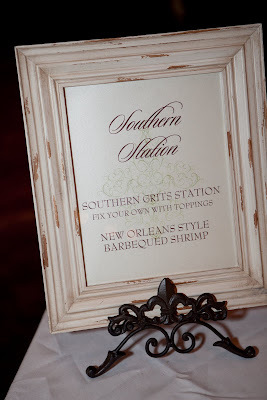 The table numbers, created by HH Design House using pictures the Bride and Groom had taken of their favorite spots in the favorite town gave a unique New Orleans touch! What a lot of work went into the shells! 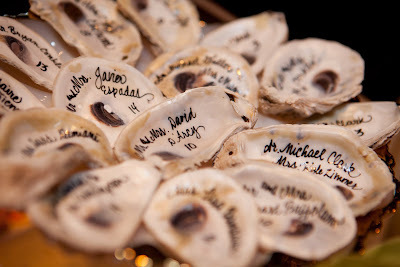 Meghan had the fabulous idea of the placecards being written on actual oyster sheels and arranged on antique oyster plates. After weeks of antique shopping, shell gathering, shell cleaning, shell bleaching, carpal tunnel flare-ups from the weird writing angles and pondering another route.... the final product was unique and fantastic. 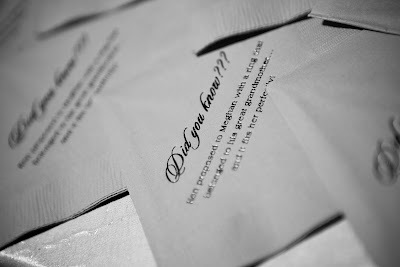 Most guests still have theirs as a momento. 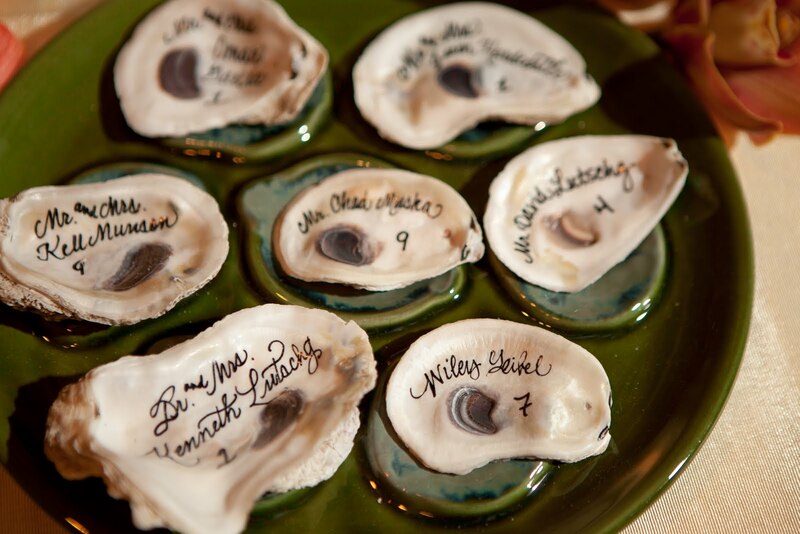 ...and those hard to find oyster plates? 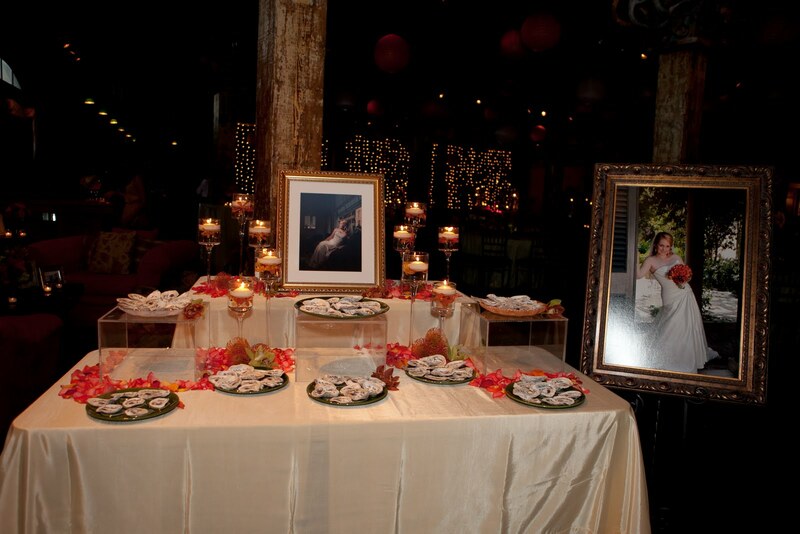 They are beautifully hung on Meghan and Ken's dining room wall. Framed Menu Cards for the Food Stations serving New Orlean's specialties. 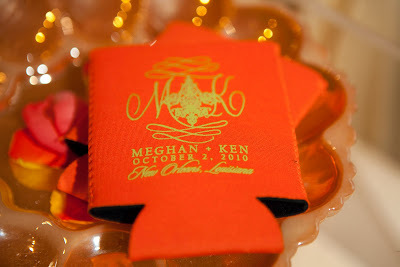 The Koozies for the Second Line were a hot commodity! The four-tiered Wedding Cake incorporated elements from the invitation. Another closeup of the Oyster placecards! 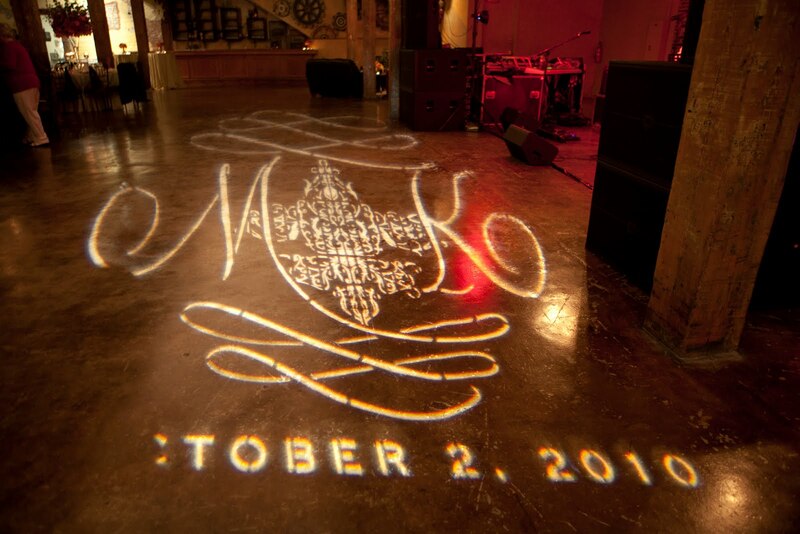 The Logo Gobo on the Dance floor! 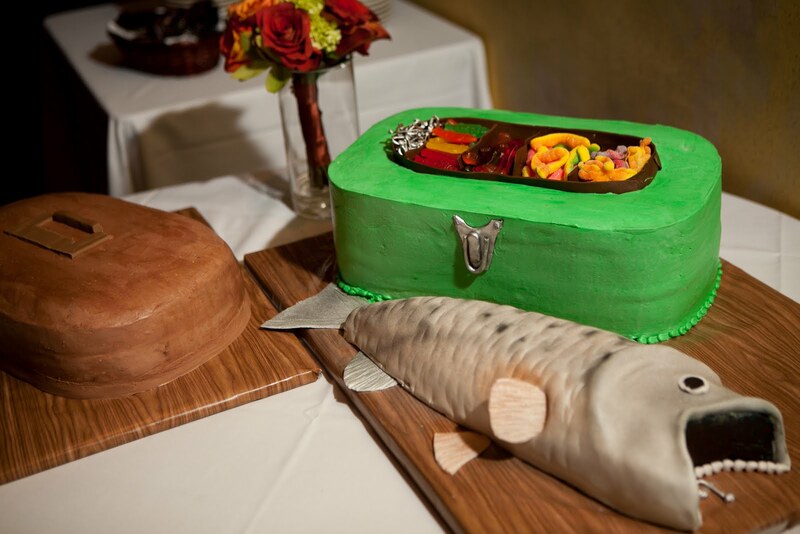 The groom's cake could not have been anything but fishing themed, and this one made him proud! The guest book was also done through HH Design House and matched the colors and feel of the day. 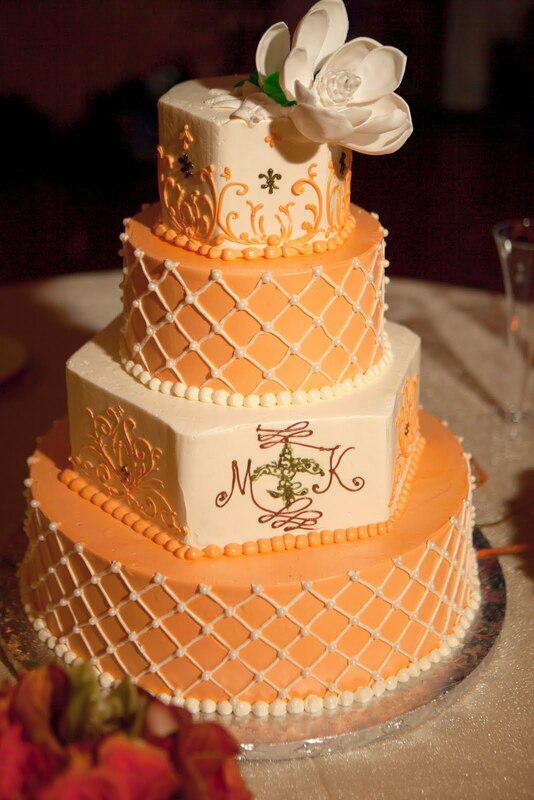 Another New Orleans tradtion: The cake pulls that tell each lady's fortune. 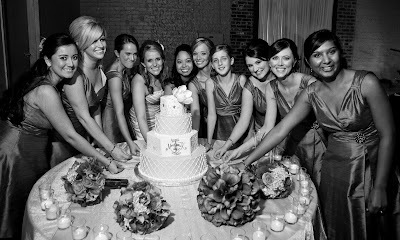 Last picture together before the dress change to really get the party started! 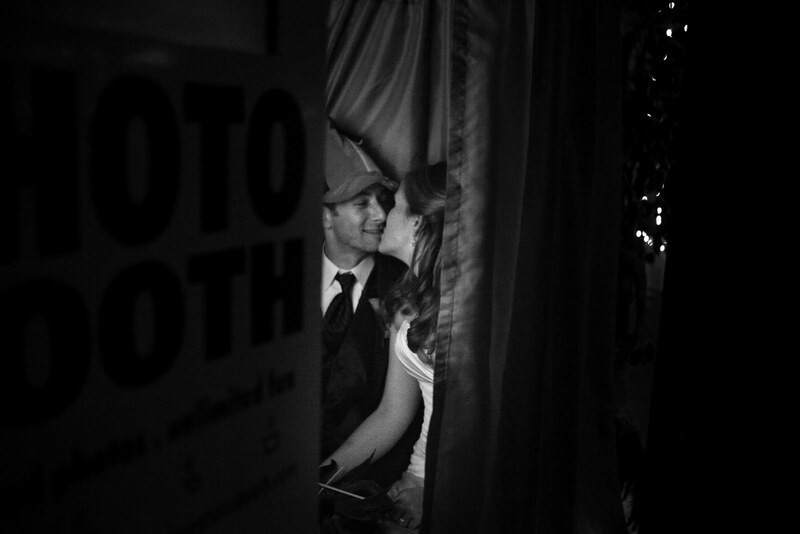 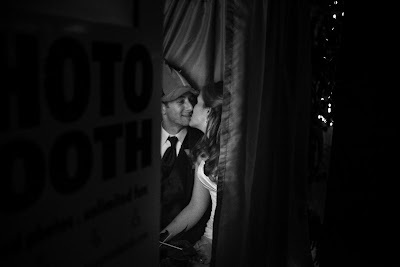 A private moment in the photo booth. 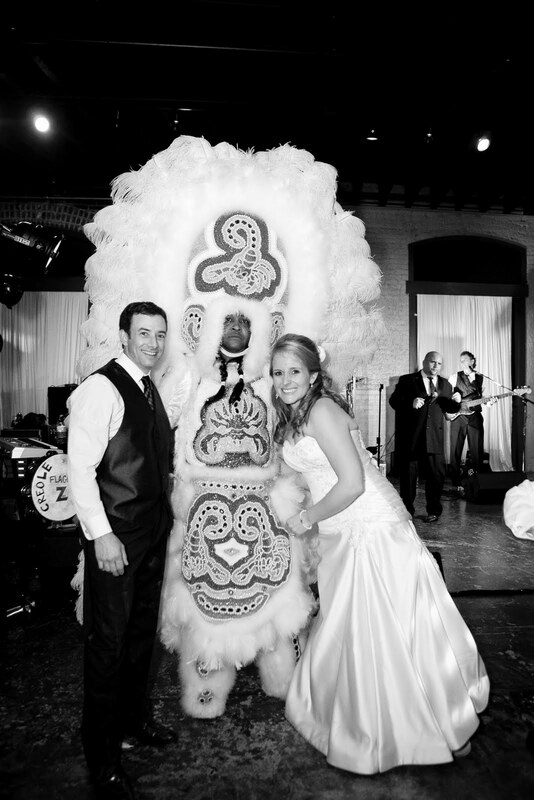 Another special New Orleans element was the Mardi Gras Indians -- they made a surprise appearance to perform blessings over the couple and invite everyone out ont he dance floor to rev it up! Cocktail napkins had different fun facts about the couple, also done by HH Design House. After as much dancing and fun as can be had, the happy couple left the reception under a tunnel of sparklers and left everyone to explore the Crescent City they love so dearly. As they say... Laissez les bon temps rouler! Or, let the good times roll.... and a Happy anniversary to Meghan and Ken!